Background: The signal is defined as “reported information on a possible causal relationship between an adverse event and a drug, of which the relationship is unknown or incompletely documented previously”. 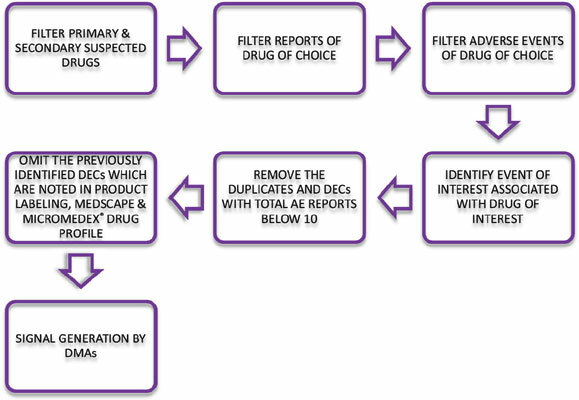 Methodology: The US FAERS database consists of 1028 iloperidone associated Drug Event Combinations (DECs) which were reported from 2010 Q1 to 2016 Q3. We consider DECs for disproportionality analysis only if a minimum of ten reports are present in database for the given adverse event and which were not detected earlier (in clinical trials). Two data mining algorithms, namely, Reporting Odds Ratio (ROR) and Information Component (IC) were applied retrospectively in the aforementioned time period. A value of ROR-1.96SE>1 and IC- 2SD>0 were considered as the threshold for positive signal. Results: The mean age of the patients of iloperidone associated events was found to be 44years [95% CI: 36-51], nevertheless age was not mentioned in twenty-one reports. The data mining algorithms exhibited positive signal for akathisia (ROR-1.96SE=43.15, IC-2SD=2.99), dyskinesia (21.24, 3.06), peripheral oedema (6.67,1.08), priapism (425.7,9.09) and sexual dysfunction (26.6-1.5) upon analysis as those were well above the pre-set threshold. Conclusion: Iloperidone associated five potential signals were generated by data mining in the FDA AERS database. The result requires an integration of further clinical surveillance for the quantification and validation of possible risks for the adverse events reported of iloperidone. Pharmacovigilance, disproportionality analysis, reporting odds ratio, iloperidone, drug safety, FAERS.